Just in case someone hasn’t seen this yet. What does it take to discredit people? Telling the public to buy Merrill Lynch and Washington Mutual, telling the public that housing prices are stable and growing…Why does anyone listen to these putzes? They openly laugh at Peter Schiff, who turned out to be 100% correct on every count, and they still get to be on television as experts. Mike, why don’t you get on television? Your predictions have come true approximately one jillion times more frequently than Charles Payne and Art Laffer. Fak. This entry was posted in Economics, News, Stupid People on 2008.11.25 by Gary. 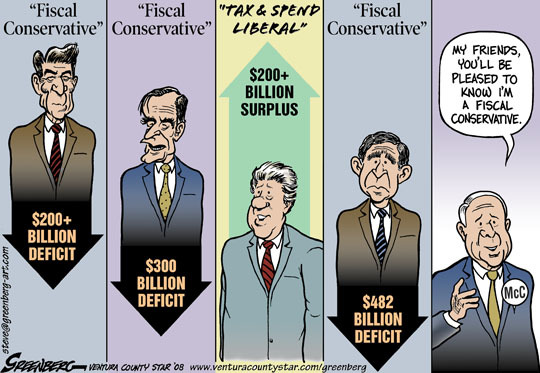 This entry was posted in Economics, Funny Stuff, Political on 2008.09.27 by Gary. July 11th, 2008 – US Government seizes control of IndyMac, largest S&L in Los Angeles and 7th largest mortgage company in the USA. September 7th, 2008 – US Government acquires control of Fannie Mae and Freddie Mac, two largest mortgage backers in the USA. September 16th, 2008 – US Government acquires 80% control of AIG, largest insurance company in the USA. This entry was posted in Economics, longasides, News, Political on 2008.09.17 by Gary. Another great example of how people who are not, by any reasonable definition, wealthy are somehow able to be convinced to support something which is not in their own self-interest. 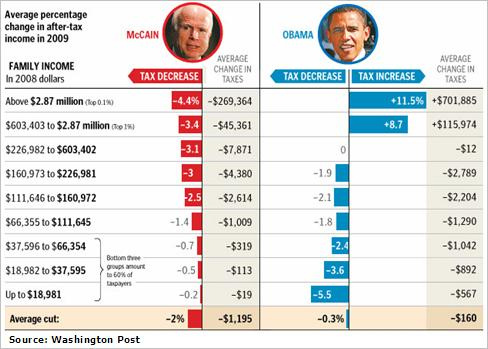 If you make less than $111,000 per year, why would you support the plan on the left over the plan on the right? You prefer to give your tax money to rich people, rather than keep it yourself? Amazing. Edit: This all assumes, for good historical reason, that the gummint isn’t planning to reduce spending, and therefore the total revenue needs to remain somewhat static. This entry was posted in Economics, Political, Stupid People and tagged taxes on 2008.09.12 by Gary. This entry was posted in Economics, News, Political on 2007.03.04 by Gary. Let me preface this with the admission that I am not making, and have never made minimum wage. Sure, during the early years of my indenture to the U.S. Army, I’m sure the wage I made, prorated hourly, was a pittance. But, they did give me a crappy room to crash in and some mediocre food and medical care. So, better than many. This week, I had a conversation with my boss about the death of the minimum wage. He is convinced that we do not need to raise the minimum wage for any reason, letting the market decide how to pay things. So, here’s a few things that I can point to as some backing for my opinion (everyone has one) that the stagnation of our minimum wage is a bad thing for the country. This entry was posted in Economics on 2006.12.14 by Gary. People don’t know if they are better off or not. Oh, well, then. We’ll just tell people they’re better off, and even if their checkbooks tell them differently, they’ll believe us. This entry was posted in Economics, Political, Stupid People on 2006.10.08 by Gary. I just saw an anti-net neutrality ad from the National Cable & Telecommunications Association. They portray Google and its allies on the pro-neutrality side as “multi-billion dollar tech companies” who just want more money from you, the poor consumer. Why, we all know that the cable and telecom companies have always done what is best for the consumer, right? Lots of people have spilled lots of ink over net neutrality in the past few months, but if nothing else this one ad would make me side with Google. If it comes down to who I trust more, Verizon or Google? Easy. Which one of those companies has ever charged me a dime? Which one of those companies has a history of near-whimsical pricing and abuse of government-sponsored monopoly power? Yeah, exactly. Hell, just last month, Verizon wanted to punk their cellular customers with an invented new fee to recoup the losses from the FCC cancelling the Spanish-American War tax. This entry was posted in Economics, Geek, Political on 2006.09.12 by Gary. According to this site, Tom Green County has a median household income $8800 lower than the national median. And, the per capita income is $5400 lower than the national per capita income. So why are we building so many new businesses here, exactly? This entry was posted in Economics on 2006.08.04 by Gary. Boy, those congresscritters really don’t seem to get it. Nobody outside the MPAA and RIAA wants a broadcast flag, no matter what you call it. As always, Cory Doctorow’s analysis is fantastic. Unduly disruptive? Hey, folks, the disruptive technologies are the ones that drive us forward and upward to ever-higher levels of economic and creative success. Phonographs, automobiles, computers, compact disks, radio, television – all disruptive technologies in their time. There is no Constitutional right to protect existing business models, and isn’t Congress supposed to be in the business of protecting the Constitution and the sovereign people of the United States? Or are they instead in the business of protecting campaign donors against their own customers? Yeah, that was rhetorical, thanks. This entry was posted in Economics, Geek, Music, Political, Video on 2006.01.21 by Gary.